I don’t believe in having guilty pleasures. The very idea of the term just suggests snobbery of the highest order. Whether that’s TV, music, books. If you enjoy something and it gives you pleasure, then who cares? Which is why I’m proud to say one of my new favourite shows on the box is one that by rights, should be set to become a jewel in the daytime crown alongside Homes Under the Hammer and Pointless. Money for Nothing has already been running for a couple of series on BBC One, where upcycler and furniture restorer Sarah Moore (pictured left, above) takes people’s old unwanted junk and saves it from landfill by turning it into something new to generate cash. And now, as with all good telly formats, has come the celebrity spin off. And after the present writer’s mum recommended it to us, we are addicted. 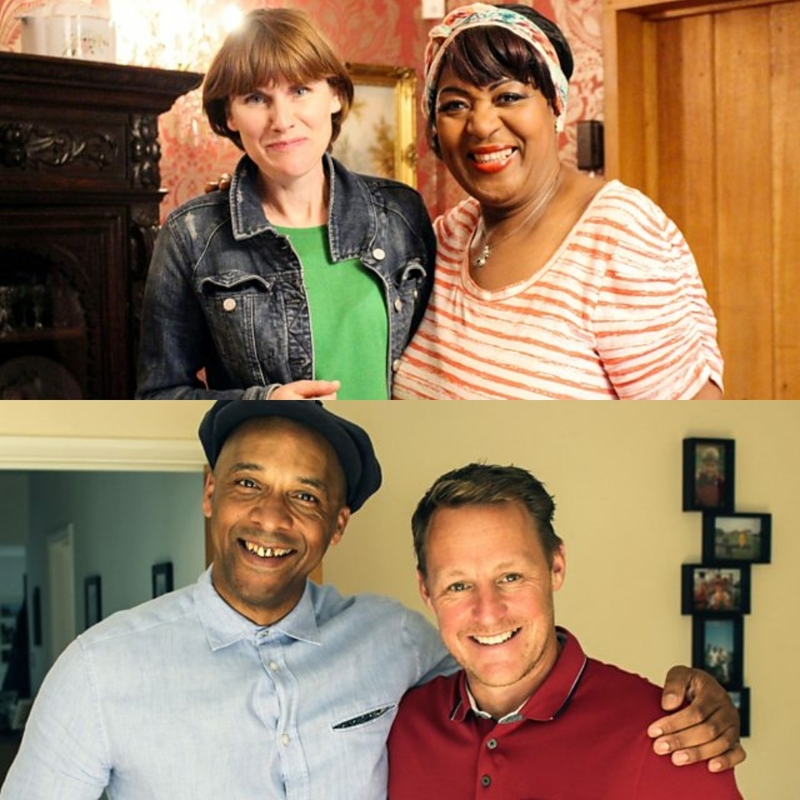 It’s much like the regular version, only this time, Sarah’s joined by a new co-host and fellow upcycler (pictured right, above), Jay Blades, himself the star of BBC Two’s The Repair Shop (which incidentally is back for a new series in two weeks’ time). And this time, it’s not members of the public being accosted at recycling centres or scrapyards, oh no. This time it’s in assorted celebrity homes up and down the UK. Celebrities in this case, being strictly of the minor variety – but no less entertaining for all that. Everyone from 80s chef Rustie Lee, to BBC Breakfast host Louise Minchin, via former GB Olympic athlete Iwan Thomas and 90s supermodel Caprice. And the money generated from the reactivated junk is donated to a charity of their choice. Some of the transformations Sarah and Jay have achieved on the previously written off are really admirable. The Caprice episode in particular, saw them transform a set of old wooden bed slats into a series of bright and colourful coat hanging solutions – one of which ended up at a children’s soft play centre – and an old air hockey table transformed into a steampunk inspired coffee table for a trendy Glaswegian clothing store. It’s a show that is so right for the present time. In an age where carbon footprints and the problem of landfill in our disposable, consumer driven society are becoming a major talking point for debate, this show demonstrates how achievable upcycling and re-upholstering old furniture and junk can be, and particularly if it’s all for a good cause. With the gaping hole left by the departure of Bake Off from their schedules last year, the Beeb would be wise to see if this celebrity version of Money for Nothing could work on a prime time slot. Celebrity Money for Nothing continues on weekdays at 3:30pm on BBC One. UK viewers can catch up with the series so far on BBC iPlayer.